Lost Boy and I have had a thing about ladybugs since 2Flowers was born. 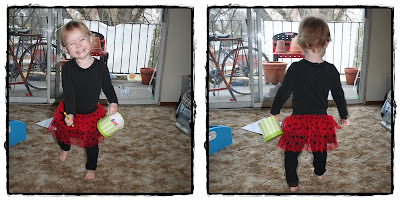 She had some super cute ladybug gear when she was smaller. At Christmas, Mimi gave 2Flowers a new ladybug outfit and this one is just perfect for her tendency to dance! The outfit actually came with a white shirt, but I like the contrast of all the black with the tutu skirt. There is also a matching red shrug with heart dots, but it was taken off before I could get a photo. It is amazing how much a pretty outfit on a beautiful little person can make your day better. All I have to do is look over at her and I feel good. I just love the first picture of 2Flowers (on the left). She looks so happy and carefree! She is. Though she recently developed a confused/concerned face. How do you survive without a TV?! Fashion Friday: Sprinkles and Cupcakes!